Peel and clean the prawns. In a pan, sauté a clove of garlic with a little olive oil, add the the prawn heads, sauté for a few minutes, then deglaze and reduce with a glass of dry white wine. 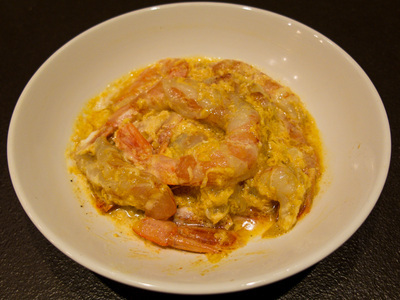 Let simmer covered for 5-10 minutes to get a lovely prawn fumet (stock). Clean the pumpkin and cut it into cubes of about 1 cm. Melt the butter in a pressure cooker (this will prevent your pumpkin from sticking), add the pumpkin, salt and a pinch of baking soda. Close the pressure cooker and cook for 20 minutes once you get the first whistle, shaking the pot initially to ensure that the pumpkin does not stick. When the time is up, remove from the heat and put the pressure cooker under cold water to lower the pressure. You will get a pumpkin that is soft and slightly caramelized in its owns sugars. 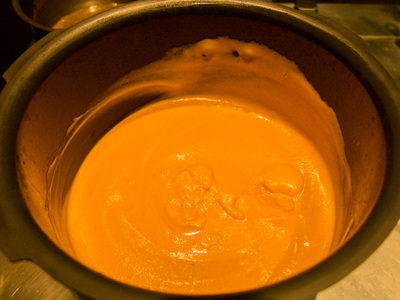 Use immersion blender to make a nice and fluffy cream. 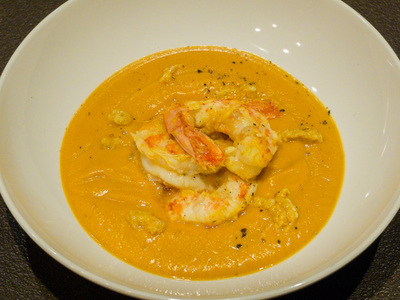 At this point, add the prawn stock, previously filtered, and the coconut milk to get the desired density (keep aside a couple of tablespoons of coconut milk that will be used for marinating). Prepare a marinade with all the ingredients, making sure to grate the ginger and chop garlic and shallots. 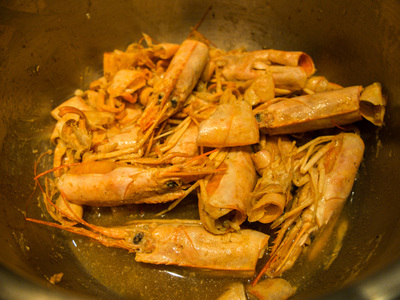 Mix well and add the previously cleaned prawns (make sure to leave the tails unpeeled). Let marinate for 30 minutes. Cook quickly, about 1 minute on each side on a pre-heated pan on high flame, adding the marinate sauce as well. 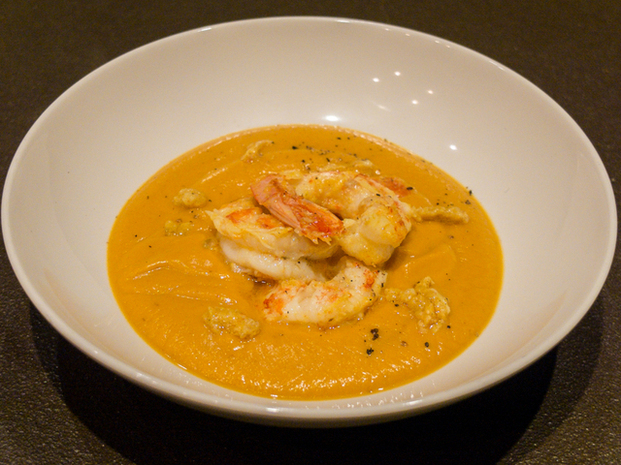 Serve the cream of pumpkin placing 3 prawns in the center of the plate and a few drops of cooking sauce from the prawns.